September 15th, 2017 | Posted by Velda in ACUPRES.,MERIDIANS, REFLEX. Chinese Reflexology is so powerful. Your feet tell you what’s going on in your body rather than your head. Emotionally speaking, a lot of stuck energy is in your head. Here is a simple exercise: Relax your mind by pressing on the reflex area to the brain, located on the big toe of both feet, in the fleshy part behind the toe nail. To calm your mind (and even relieve headaches), pinch both big toes with your thumb and index finger for 10 seconds. Release and then press again for 10 seconds. You can also make small circles with your thumb in the flesh of the big toes. the reflexology point for the right side of your brain is on your left toe and the point for the left side of the brain is on the right toe. 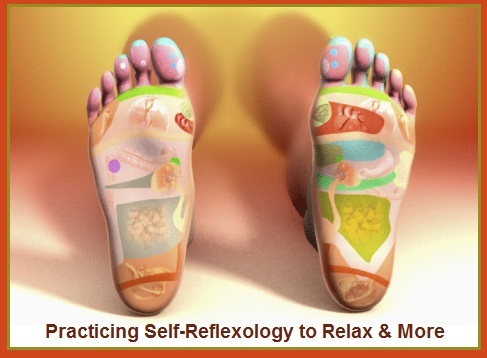 Almost everybody has tension here, so I always suggest stimulating the reflexology area to the neck, which is located at the base of the big toe on both feet. Make small circles here with your thumbs for one or two minutes. Press on the inner edges of both feet, from the heel to the big toe, to relax your entire back. This is the reflex area to the spine, and pressing here can help your entire body “let go” so you can sleep. 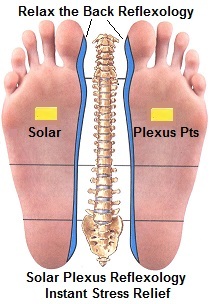 The Solar Plexus Point can be found by gently squeezing the top of the foot inward and seeing a dimple or hollow space. When pressing directly on this point with your thumb, it can relax the entire body, restore calm and bring instant stress relief. Hold for 30 seconds, release and repeat on both feet. If you have consumed too much sugar and it is keeping you awake, try this — on the sole of the right foot, press close to the outer edge of the foot just above the half way point between your heel and your toes. This is the reflex area to the liver, and pressing here for 10 seconds (release and repeat about six times) can help your body to detox and improve your sleep. Devote special attention to the outer portion of the arch, rolling your knuckles from the ball of the foot toward the heal. Finish by using your right thumb to rub the arch, working from the outside of the foot inward. To enhance results, use massage oil or lotion that contains essential oil of lavender, sweet orange, or rose to induce calm and reduce stress.